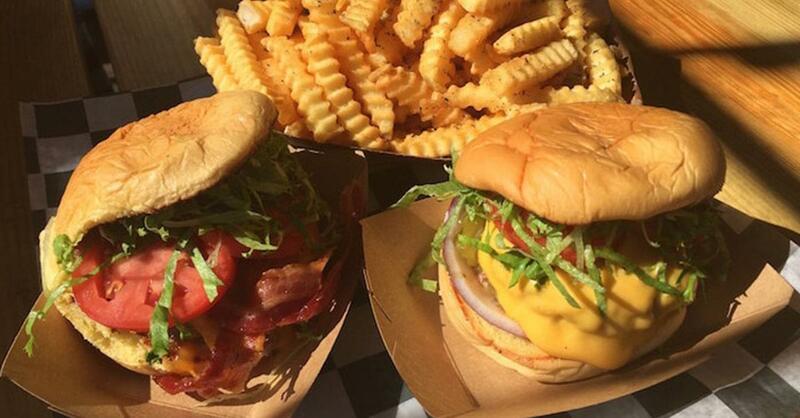 Al’s Burger Shack in Chapel Hill has been named the best Burger in America by TripAdvisor! TripAdvisor announced the top burger restaurants in the US based on millions of reviews and options from TripAdvisor diners. Local restaurant Al’s Burger Shack topped the list with their local and sustainable burgers. Top 10 Burger Restaurants in the U.S. Located steps away from the University of North Carolina campus, Al’s Burger Shack prides itself on being local and sustainable – serving up juicy, all-natural, hormone and antibiotic-free burgers since 2013. Starting the week with “Marcus Paige”: 3 buddy bite burgers, 3 slices American cheese, 3 slices bacon, AL sauce, lettuce, tomato. Our go-to! With more than 40 years of combined hospitality experience, Todd Brooks and his wife moved their family to Naples to open Brooks Gourmet Burgers & Dogs in 2010. Now operating three locations, the couple has remained committed to delivering the perfect burger. Founded by cousins Gabe Lovelace and Erik Hustad, Honest Abe’s Burgers & Freedom has been serving 6-ounce patties to the Lincoln community since 2012. Named after founder Collier Albright’s grandfather, Grumps Burgers continues to provide top-notch burgers and service in a fun, clean, affordable, and casual atmosphere. Located in a house in the Slabtown district – a west-side Traverse City neighborhood named after the housing style from logging days – Slabtown Café and Burgers patties up to 800 pounds of burger daily. Burger Republic has been serving up gourmet burgers – using only 100% fresh certified Angus Beef – along with American craft beers and hand-spun milkshakes to Nashville travelers and locals since opening its first location in 2012. Founded in 2003, Pearl’s has developed a loyal San Francisco fan base for its classic burgers served in a no-frills atmosphere at an affordable price. Back Door Grill has a passion for fresh ingredients, old fashioned burgers and cold brews. The local joint has been serving all-natural Colorado beef burgers paired with hand cut French fries and onion rings to the Steamboat Springs community since 2014. Started in honor of owner Bruce Bollinger’s immigrant, pioneering grandmother Agnes MacPhail, MacPhail’s Burgers is a family-operated restaurant that has remained dedicated to creating the best burgers, fries and milkshakes in a rustic, friendly environment since 1945. With no prior restaurant experience, avid griller and self-taught chef Brad Halsten opened The Burger Dive in 2010. Today, the restaurant continues to pay homage to the classic drive-ins and diners, while simultaneously delivering innovative, high-quality burgers. Methodology: The list is based on the reviews and opinions of TripAdvisor diners, taking into account the ratio and quality of great burger reviews in comparison to overall reviews, along with quality and quantity of reviews received in past year (ending May 2018). Featured restaurants have a minimum of 4.5 out of 5 bubbles, 200 reviews and 10 locations or less as of June 2018.